The key question for the years to come: how do we do mobile? If “social” was a storm that swept across the web then “mobile” is a hurricane that will leave nothing unchanged – on the web and without any doubt also within companies. Mobile is not just quickly becoming the primary screen for information consumption in our everyday lives, it also enables an unmatched ability to actively push information to users. Social intranets often suffer from disappointing employee participation and look desperate for possibilities to better reach and engage their users. And yes, we see great results for mobile channels in terms of active users. But users activation is just one promise of mobile reachable intranets. Most intranets today suffer from their limited access by employees without a pc at work. These non-desk or offline employees often work directly at the front line with the customer and are key for customer experience. 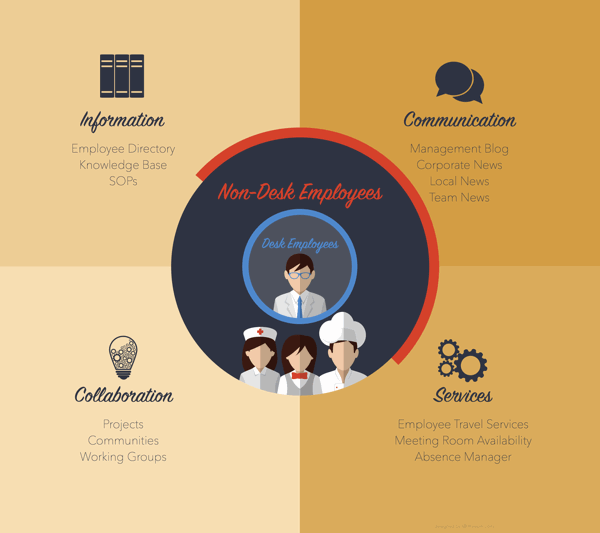 Social intranets often do not reach theses people and create a digital gap between desk and non-desk employees. 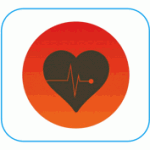 The obvious question is now: why is it so hard to enable the mobile channel for an intranet? Modern social intranets come with a build-in information security conflict: due to their collaboration and project management team rooms they contain far more business critical information and documents that ever before. So companies will work hard to make this content as secure as possible. On the other hand there is the desire to reach all employees on the mobile channel and even on their private devices. It is impossible to fit both requirements with the same platform. For many years, one platform for all uses cases of the digital workplace was the goal of it strategists. The rise of SharePoint is one of the consequences. 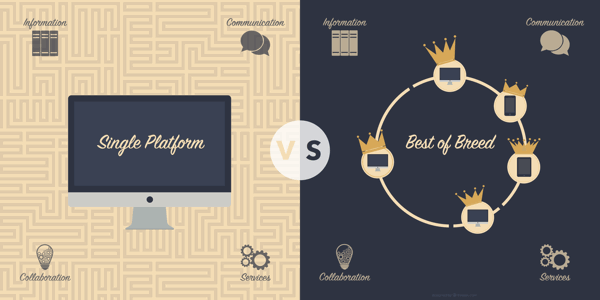 The question “Do we build the digital workplace with one platform or a selection of best of breed solutions?” was often answered with the big platform. With the rise of mobile and cloud this discussion will dramatically change in the years to come. 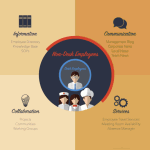 The best of breed digital workplace contains specific services that target specific use cases. No doubt, SharePoint will continue to be the major player for collaboration at the workplace and (with the ongoing extensive use of documents) with a clear focus on desktop use. A mobile intranet CMS will be crucial as a branded information and communication channel that works on all types of devices, all languages and geographies and for users – no matter if they sit on a desk at the office, stand on the production floor or face customers at the frontline.